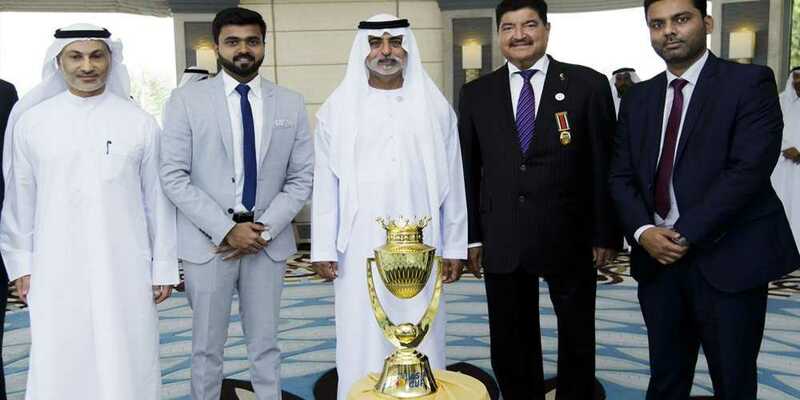 The Unimoni Asia Cup 2018 trophy was unveiled at a quiet ceremony in Abu Dhabi on Wednesday afternoon by Sheikh Nahyan Bin Mubarak Al Nahyan, Cabinet Member and Minister of Tolerance and Emirates Cricket Board Chairman (ECB). Khalid Al Zarooni, Emirates Cricket Board Vice-Chairman; Mubashshir Usmani, General Secretary of the Emirates Cricket Board; Prabhakaran Thanraj, Marketing Manager of the Board of Control for Cricket in India (BCCI) — who attended on behalf of both the BCCI and The Asian Cricket Council; Dr BR Shetty, Finablr Founder and Chairman; Vijay Sajjanhar, Dubai Sports City Chief Financial Officer and Mathew Boucher, Abu Dhabi Cricket Club Acting CEO, were among those who attended. Looking ahead to the event BCCI CEO, Rahul Johri, said “I would like to extend my gratitude to Sheikh Nahyan for his continuous support. Perera added: “The UAE has been an intrinsic part of cricket history, and we are delighted at the opportunity of holding the Unimoni Asia Cup 2018 across the cities of Dubai and Abu Dhabi. “The Asian Cricket Council is committed to promoting the growth of cricket in the region, through not only the popularity of its strongest teams, but also by supporting the rise of associate members through their interactions with full members. Commenting on the association with Unimoni Asia Cup 2018, Shetty, said, “It is a matter of great pride for Finablr that Unimoni and UAE Exchange are associated with Asia Cup 2018.